Our range of products include laser cutting machine and mixed laser metal & non metal cutting machine. It is regularly used in industries, like advertising, craftwork making, mould making, toy manufacturing, etc. The laser cutting and engraving machine can cut and engrave on non-metal materials such as bamboo ware, wood planks, coconut shells, paper, organic glass, double color boards, acrylic, marble, jades, crystal and more. the proprietary software which supports the output of various files format PLT, BMP, DXF, DST, AI, T100, etc. 1. This machine is newly designed model to meet the increased requirements of using co2 laser tube to cut both metal and nonmetal materials. It has special designed machine structure and laser head, with the help of the oxygen gas to obtain good metal and non-metal cutting result. 2 .Unique oxygen gas control system refrain you from worrying about how to control the gas during cutting. 3. 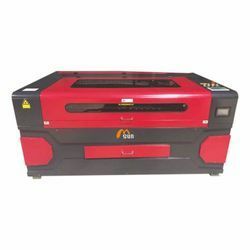 And compared with some other laser use only for metal cutting like fiber, YAG, this machine has large cutting material area, and more reasonable price, it is a good choice for all the customers who want to do cross industry business. 4. This machine can be customized, we will according to your situation do some special change for you. 1. 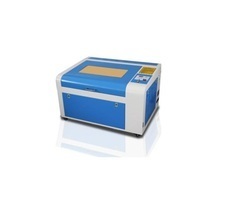 Economical with cost-effective metal and nonmetal laser cutting machine. 3. Lower investment cost, lower operating cost and lower maintenance cost. 4. Non-contact height-adjusting configuration enables to cut almost all materials with lowest cost. 5. Working table: Open blade with special treated material. Never fray and easy operation, suitable for all kinds of hard materials. 6. Steady chassis: Stability and precision during high speed work. 7. Moving system adopts Taiwan PMI linear guide and precision gear, matched up with advanced DSP Panel controlled 3-phase stepper motor to ensure the working accuracy. 8. High efficiency tube with stable laser path, life time around 10,000 hours.